The Jaybird X4 dosen't make any drastic changes to the wireless earbud formula that's been working so well for Jaybird. But the addition of an IPX7 waterproof certification makes these a tangible upgrade to the previous models. Jaybird has been leading the charge for Bluetooth fitness earbuds for years. 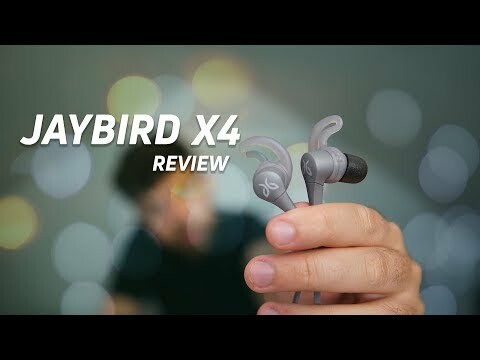 The Jaybird X2 blew the competition away when they came out, and last year the company released the true wireless Jaybird Run, which we liked but weren’t blown away with. Today, Jaybird is playing to its strength and releasing a brand new pair of Bluetooth earbuds: the Jaybird X4. So are they any better than the previous models or is it the same ‘ol story with a different cover? Let’s find out. Who should buy the Jaybird X4? Fitness lovers. Just like the Jaybird X3 and X2 before it, the Jaybird X4 has a little bit of everything and is a great all-around pair of exercise earbuds. People debating if they should get the older X3. Normally, I’m all for waiting for a new version of something to come out. Not because I want to buy it, but because I want to buy the older version at a cheaper price. I can’t say that here because the addition of IPX7 waterproofing is definitely worth the money to me. The control module on the Jaybird X4 is just as slim and functional as its predecessor. Let’s jump into the biggest upgrade with the Jaybird X4 earbuds: waterproofing! One of my big complaints with the previous Jaybird X3 earbuds was that they weren’t waterproof, they only had a sweatproof coating. The Jaybird X4 take that sweatproof coating, and raise you an IPX7 waterproof certification which means that you no longer need to be worried should you get caught in torrential rain or drop these in a pool. An IPX7 rating means you can submerge them for up to 30 minutes in up to a meter of water. These aren’t the first earbuds to have a sweatproof coating and an IPX7 certification, but it’s a welcome addition to the Jaybird line-up even if it is the company playing catch-up. The Jaybird logo is now painted on the earbuds. Besides that, there really aren’t too many differences in how these look and feel. The story is similar to the last time with emphasis put on refining the line instead of re-defining it. They’re still made of plastic (which is good because it keeps them light at about 14.7 grams), and the control module is still super slim. It’s almost exactly the same as on the Jaybird X3, which isn’t bad considering how slim that control module was as well. The only other new features I could find had to do more with design than with build quality. The Jaybird logo is now part of the paint job instead of imprinted on a cheap metallic sticker, the wing tips just have one big hole now instead of a ton of smaller ones, and the nozzle on the all-gray model is painted blue, and I’m all for it. No one will know but you whenever you change the ear tips, but that’s why I like it. It’s your little secret. The new Jaybird X4 earbuds have a new wing tip design when compared to the previous version. The control module has three buttons on it and, just like the previous module, they all work fine and I had no problem reaching for them while running to adjust volume or skip between tracks. Speaking of running, I was a huge fan of the plastic cinch on the cable that lets you adjust the cable. The Jaybird series has always had it, but I was never able to make it work for me and just ended up wearing the earbuds dangling under my chin. These are the first time I was able to wear them comfortably behind my head, without needing to worry about them slipping out of my ears. So yeah, the fit is pretty great. Especially when you swap out the silicone ear tips for the memory foam ones (which also help with isolation). Unfortunately, everything is a give and take. Although the memory foam tips helped with isolation they were surprisingly uncomfortable, and I picked the smaller of the two pairs that come included in the box. But I’ll gladly trade a slight discomfort for better sound any day of the week. The Jaybird X4 now have an IPX7 waterproof build. Connection strength was average for what you’d expect for a Jaybird product, which means that it’s better than good enough but not amazing Practically, I had no issues. I didn’t experience any skips while running or when I was wearing them while I was walking around my room, and when I was testing range I didn’t have any dropouts until I reached out 30 or 40 feet. So even by regular Bluetooth standards: it’s pretty legit. Again, practically I had no complaints, but the nerd in me still wishes these had Bluetooth 5.0. Playback controls were also intuitive, and I didn’t need to look in the instructions to figure it out. You can adjust the volume by tapping the plus or minus buttons and skip between tracks by holding them down. Then there’s the multifunction button in the middle which acts as a pause/play button (or answer/end call button) when tapped, and gives you access to Siri or the Google Assistant on a long press. The memory foam tips help with isolation, but are surprisingly uncomfortable over long periods of time. Then there’s the Jaybird app that you can connect to with your Spotify account and play music through, though I don’t know why you would. What’s actually useful is the EQ presets that you can sift through to change how your music sounds. And if you don’t find one that you like you can always make your own and save it as a preset. Then there’s battery life. Jaybird claimed 8 hours on the previous X3 earbuds and pretty much hit the nail on the head. With the Jaybird X4, nothing has changed. They claimed 8 hours of constant playback and in our testing, we got 7.5 hours. So yeah, it’s safe to say that whether you’re going to be commuting to work, or hitting the gym after you won’t have to worry too much about these dying on you. To charge them, just pop them on the charging cradle just like the previous version, and plug them into a USB port. Still annoying, but at least Jaybird is consistent. The nozzle on the Jaybird X4 is a bright blue color (at least on the gray model). Though you can change the way these sound via the app, I kept these on the “flat” profile which is how they’re set fresh out of the box. Even still, the Jaybird X4 ‘buds seem to have a slight emphasis on lower notes. The thumping bass kicks in the song Generator ^ Second Floor by Freelance Whales wasn’t overpowering at any point, and I’d say that the slight push actually helped me hear the music a little better while I was running outdoors. Lower notes are usually the first to go when there’s outside noise and the extra umpf helped nicely, though you might be disappointed if you’re used to the exaggerated bass of something like the Powerbeats3. But if you do fall into that category, you can always just pick that sound profile in the app. I wasn’t a huge fan of the mids and it’s probably because these seem to emphasize vocals a little too much over other instruments. This was apparent in the song Street Lights by Kanye West where his already autotuned voice was masking some of the softer elements in the background. Again, not bad if you want to sing along to your music while you’re working out, but not the best for hearing the nuances in your favorite tracks. As is the case with fitness wireless earbuds that you’re going to be using at the gym, I don’t think the lack of sound clarity is an issue. The Jaybird X4 sound more than good enough for anyone hitting the gym or going for a run, but there really isn’t a drastic difference from their predecessor, the Jaybird X3. Furthermore, they look almost exactly the same, so if you already have a pair of Jaybird X3 earbuds: you probably don’t need to go rushing to order these. That said, there is one aspect of the headphones that to me, makes them an easy recommendation over the previous versions and that’s the IPX7 waterproof certification. The X4 addressed some of the biggest critiques of the previous Jaybird X3 earbuds, so in that sense: kudos to the people at Jaybird for actually listening to feedback! Plus, the Jaybird X4 earbuds cost $129 which is the same price that the Jaybird X3 was at launch—so you’re not going to be paying extra for the upgrade. That said, we know it’s still pretty expensive (even if that’s inexpensive for a Jaybird product). So if you want to go with some less expensive earbuds that will get the job done, we got you covered. But if you’re ready to make the jump to a pair of the internets favorite workout earbuds, then there’s really no reason to get the Jaybird X3 earbuds over the new Jaybird X4’s. Even if the X3 ‘buds go on sale, I’d still rather have the peace of mind of IPX7 certification plus the sweatproof nano-coating, but that’s just me.